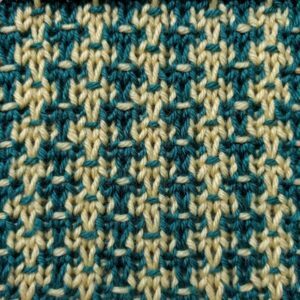 The Speckled Tweed stitch is a multi-colored slip stitch pattern that is knitted in a multiple of 4 stitches plus 3. -The interesting design of this pattern creates a diamond-like motif which runs vertically throughout the work. With its most complicated technique being slipped stitches and also knitted in a short 4-row repeat, the Speckled Tweed stitch is rated easy, making it perfect for knitters who are just starting out knitting with multiple colors. Row 1 (WS) (Color A): p1, vb, sl 1, yf, *p3, yb; sl 1, yf; rep from * to the last st, p1. Row 2 (Color A): k1, sl 1, *k3, sl 1; rep from * to the last st, k1. Row 3 (Color B): p3, *yb, sl 1, yf, p3; rep from * to the end. Row 4 (Color B): k3, *sl 1, k3; rep from * to the end.